Roll to enhance your day! 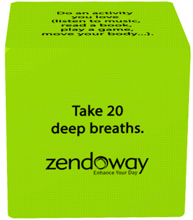 These soft, colorful cubes provide simple suggestions for Kids and Adults to nourish the mind and body throughout the day. Plus, squeeze for stress release! Ideal for use in counseling and therapy sessions, classrooms, conversation starters, daily reminders and family fun. The 4-cube set comes in a convenient draw-string bag. Kerry Alison Wekelo is the founder and visionary of Zendoway and hopes to share with you from all her life experiences. She holds a certification in children's yoga from Radiant Child Yoga. Kerry received her B.S. in Finance and Marketing with Minor in Psychology from Virginia Tech and earned her MBA in Information Systems from the University of Phoenix. After years of personal exploration, Kerry has discovered that focusing on overall wellness replenishes energy, creates healthier relationships and provides excellent insight into life. It has become her passion to help share this with others. Kerry serves as the Director of Human Resources and Operations for Actualize Consulting in which she spear-headed and runs a successful wellness program. Her trademark program ‘Enhancing Your Day’ teaches some of the nation’s top executives on how breath and movement throughout the day improves relaxation and creates deeper levels of awareness. In addition to wellness and leadership articles, Kerry has authored Audrey’s Journey a children’s book series focused on living with compassion and joy; Pile of Smile Activity Book to give away free while the children undergo treatment and the Award Winning If It Does Not Grow Say No to teach kids about having fun with nutrition. Kerry has completed the Spirit Junkie Masterclass Level One Training with Gabrielle Bernstein. She is a 500 RYT with 200 hour under Rolf Gates and 300 hour under Beloved Yoga.